According to the Human Rights Watch, more than 10,000 civilians were killed or wounded during 2018, out of which one third were children. Reportedly, innumerous deadly attacks were carried out in urban areas by insurgents. 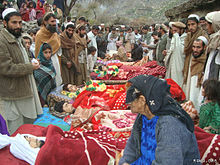 Airstrikes and night raids by the US and Afghan forces also caused heavy civilian causalities. ^ McWilliam, Ian (2002-12-27). "Central Asia pipeline deal signed". BBC. Retrieved 2008-05-18. ^ "Bush Rejects Taliban Bin Laden Offer". www.washingtonpost.com. Retrieved 2018-10-23. ^ "Bush rejects Taliban offer to surrender bin Laden". The Independent. Retrieved 2018-10-23. 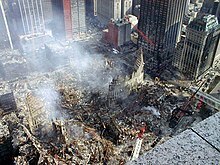 ^ "CNN.com – U.S. rejects Taliban offer to try bin Laden – October 7, 2001". edition.cnn.com. Retrieved 2018-10-23. ^ Staff and agencies (2001-10-14). "US warplanes launch new wave of attacks". the Guardian. Retrieved 2018-10-23. ^ a b Staff and agencies (2001-10-14). "Bush rejects Taliban offer to hand Bin Laden over". the Guardian. Retrieved 2018-10-23. 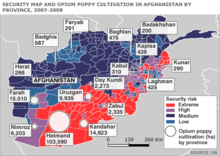 ^ "Staggering Afghan death toll revealed". 2019-01-25. Retrieved 2019-01-25. 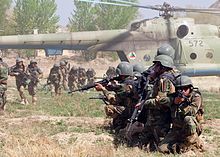 ^ a b "Preliminary findings indicate airstrike killed and injured 26 civilians in Helmand province". UNAMA. 2018-11-29. Retrieved 2018-11-30. ^ "US strike killed 23 civilians, UN says". BBC News. 2018-11-30. Retrieved 2018-11-30.